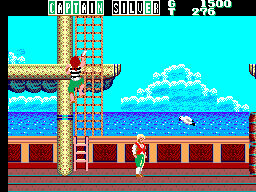 "In Captain Silver, you assume the role of Jim, a brave young lad with a taste for adventure. 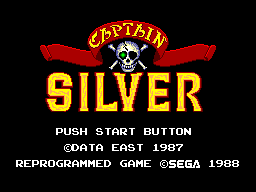 You embarks on a journey to find Captain Silver's secret treasure hoard. The treasure is rumored to be hidden on an island in the Eastern Seas. But the journey is a perilous one, as countless monsters and pirates lie in wait. Can you fight your way through to riches beyond your wildest dreams?" 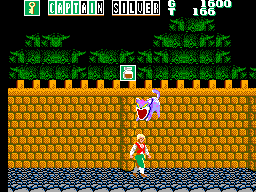 After you lose your last life, on any level, press up on the Directional Pad and Button 1 in order to continue. It can be done three times.